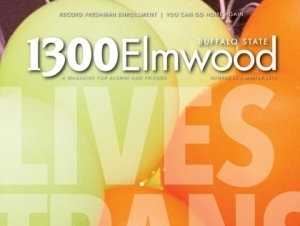 The winter 2015 edition of 1300 Elmwood, the magazine for SUNY Buffalo State alumni, is now available in print and digital formats. Read the current issue to get updates on your alma mater, catch up on fellow alumni, and learn how Buffalo State continues to transform lives. Cover story: "Lives Transformed: Results from a Historic Campaign"
Feature: "Our President: The University of Virginia has Jefferson. Buffalo State has Cleveland."